I have been doing a lot of work over the last year looking at how Information and communication Technologies can be used for Careers Advice, Information and Guidance, both in terms of providing direct services to young people and adults and in terms of supporting careers advisers. New Zealand seems to be leading in this work. This post is taken from a report I produced earlier this year, along with Jenny Bimrose and Sally Anne Barnes. ‘Career Services’ is the name by which the national organisation that delivers careers guidance support is known in New Zealand. It is a government funded organisation that regards itself as ‘New Zealand’s leading provider of independent career information, advice and guidance’. It aims to provide all people living in New Zealand with ‘access to the best careers information, advice and guidance to achieve their life goals’. Our Advice Line is a small team of trained career advisers located in central Wellington. We’re here to help you with your career planning. When you contact us (by phone or online via web chat or email), we’ll assess your situation and suggest career options suited to your needs. If you need more in-depth support, we’ll make an appointment for you to talk to one of our guidance staff either over the phone or in person. We’re open from 8am – 8pm weekdays, and on Saturday from 10am – 2pm. Following the successful pilot, the advice line (contact centre) team has grown to 15. This team currently offers a service to clients of all ‘ages and stages’ all around the country, both by telephone and face-to-face. Careers practitioners have had ‘significant training and coaching in asking more open questions, making greater use of the interactive tools on the website with the client, identifying client need and referral processes’. The practitioners actively involved in delivering this new service have indicated how the conversations they have with clients are more direct than those they have face-to-face. The pace is more intense, with pauses and silences amplified, and rapport is being built up throughout the call (rather than at the early stage of the interaction). Practitioners have also reported that this method of delivery is more demanding on their energy. Supporting practitioner self-care has consequently become more of a priority for the service. The Quality Standards Manual for the Careers Guidance Services is currently being re-written with sections on telephone guidance and online guidance being developed. This manual contains minimum quality measures for service delivery by telephone (e.g. total delivery time will not exceed 1.5 hours per client, including administrative tasks); an outline structure for a phone career guidance sessions (that is, a six stage model of guidance); and the key skills required (micro-counselling skills; excellent listening skills; solution focused counselling skills and the ability to use scaling questions). Looking for information or want some personal help? 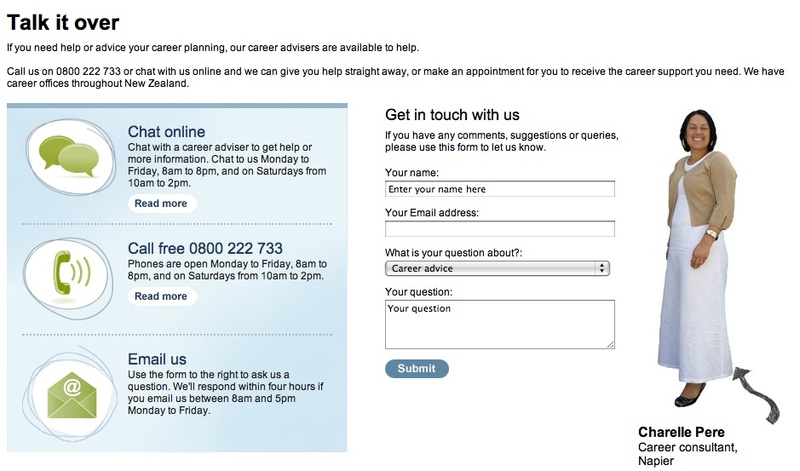 Chat online to a career adviser, who can give you independent advice to help you with career planning. Our advice line is open from Monday to Friday, 8am to 8pm, and on Saturdays from 10am to 2pm. 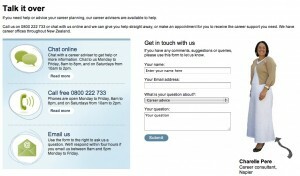 Use the form to the right [on-line questionnaire] to ask us a question. We’ll respond within four hours if you email us between 8am and 5pm Monday to Friday. The introductory pilot for the telephone guidance ran from July 2007 to end of February, 2008. It involved one experienced consultant who was based at the Careers Services’ advice line. During the pilot year, the practitioner dealt with 226 clients. The process of introducing this telephone service highlighted potential advantages for clients together with challenges it poses for practitioners. Flexibility emerged as the key advantage of this service for clients, with practitioners needing to use already acquired skills in slightly different ways as well as develop some new skills (England, van Holten and Urbahn, 2008). the value of quality monitoring and peer feedback. An important feature of the shift towards internet-based guidance was the introduction by the Career Services in New Zealand of a needs assessment model, based on the client’s self-efficacy, confidence with self-help via the web and level / complexity of need. As part of their change management strategy, the Careers Service created a blog for staff, where careers practitioners could express their feelings, ask questions and have debates around the use of technologies in service deliver The animator placed the following question on the blog:E-mail may be the most important, unique method for communicating and developing relationships since the telephone.’ (John Suler, The Psychology of Cyberspace, 2004). Most career practitioners agree that one of the career profession’s foundational and ongoing principles is that a face-to-face, facilitative relationship is an essential component for effective career counselling. There is also an unwritten assumption that visual clues and non-verbal communications are superior to written text in forming and maintaining an affective relationship. Do career practitioners believe that face-to-face interactions are deemed more effective than online ones, and John Suler and other online advocates are talking nonsense?’One response is typical of the views expressed by P.A.s who participated in the research undertaken for this study. Whilst this service’s engagement with flexible methods of delivery, including internet-based guidance, is relatively new, it provides an illustration of a large, national service addressing the staff capability issues that this venture implies, in a measured way. From this and other respects, it can be regarded as an interesting and excellent model practice. This entry was posted on Thursday, May 6th, 2010 at 15:38	and is filed under Career Guidance, careers, ICT, Innovation, Wales Wide Web. You can follow any responses to this entry through the RSS 2.0 feed. Both comments and pings are currently closed.